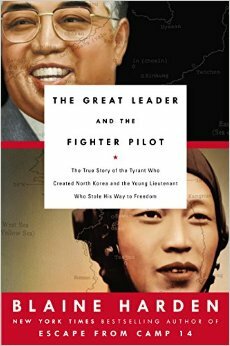 Veteran journalist and author Joseph C. Goulden offers a good review in the Washington Times of Blaine Harden's The Great Leader and the Fighter Pilot: The True Story of the Tyrant Who Created North Korea and the Young Lietenant Who Stole His Way To Freedom. In September 1953, bold headlines dominated American newspapers. “Mystery Red MIG Lands Near Seoul,” trumpeted the San Francisco Chronicle. The North Korean pilot, Lt. No Kum Suk, aged 21, was so disgusted with the totalitarian state shaped by the Soviet-installed dictator Kim Il Sung that he broke off a training flight to land near Seoul, the South Korean capital. Early press reports attributed the defection to “Operation Moolah,” the offer of $100,000 (about $900,000 in today’s dollars) to the first North Korean, Russian or Chinese pilot who defected in “a modern, operational, combat-type jet in flying condition” — meaning a Soviet-made MIG fighter, which USSR pilots were secretly flying on combat missions. U.S. planes littered North Korea with more than a million leaflets publicizing the offer. But to the utter surprise of everyone involved, Lt. No had never heard of the reward. Rather than being a “Moolah Man” he was a brave person determined not to live in a totalitarian communist state. He defected for principle, not money. Blaine Harden’s skillfully crafted book meshes two stories. First is how the Soviets installed Kim Il Sung as dictator of North Korea in 1945. Essentially a faux “hero” of the war against the Japanese, Kim’s utility was that of willing toady. With Soviet power at his command, he crushed any hopes of a free society, brutalizing his own people. No Kum Suk chafed under Kim’s iron-hand rule. In the pre-World War II era, his father was an executive in an industrial plant owned by the occupying Japanese. The father accepted Japanese rule as a way of life, as did his son. Indeed, in the waning months of the war, Lt. No wanted to volunteer as a kamikaze pilot to attack American warships. “Are you crazy?” shouted his father. Lt. No’s attitude toward America changed dramatically once Kim and his communist masters took over Korea. Heavy-handed propaganda was belied by the hungry misery of everyday life. (Nonetheless, more than two decades ago, research by CIA analyst Helen-Louise Hunter concluded that Kim Il Sung’s propaganda permanently influenced several generations of North Koreans). Thank you for introducing me to what sounds like a fascinating book; I will track it down at the library or elsewhere. I remain baffled that North Korea can exist. What a horror! I wonder how much longer the long nightmare for the millions of innocent North Koreans will continue. I'd like to read this book as well. North Korea is something the late Rod Serling might have dreamed up for The Twlight Zone. The country sounds like Hell on earth.